Concurrent routes should be avoided and their number reduced where possible. EXAMPLE: A state highway joins a US highway and runs concurrent with it into Town X. 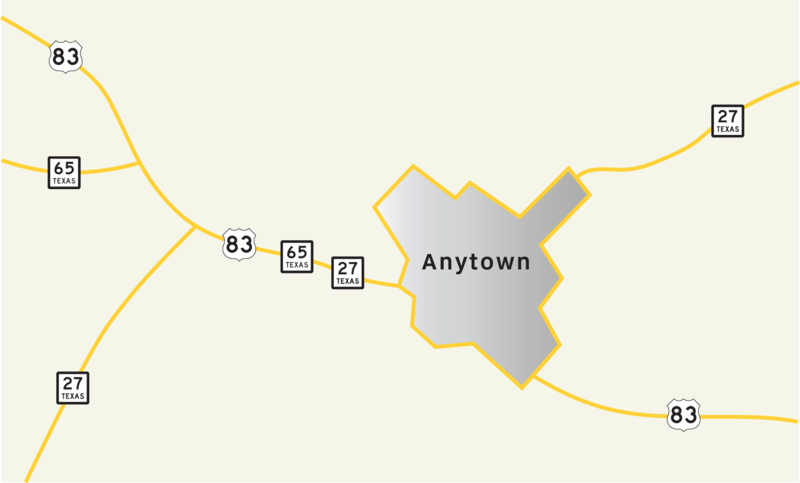 The US highway continues through the town, but the state highway ends at the town (see Figure 7-1). The concurrent signing should be eliminated, terminating the signing of the state highway where it joins the US highway. Figure 7-1. Example of unnecessary concurrent signing. Signing for SH 65 should terminate at junction with US 83. Authorization for classifying, making, and signing state highways is provided to TxDOT under Section 201.903 of the Texas Transportation Code. 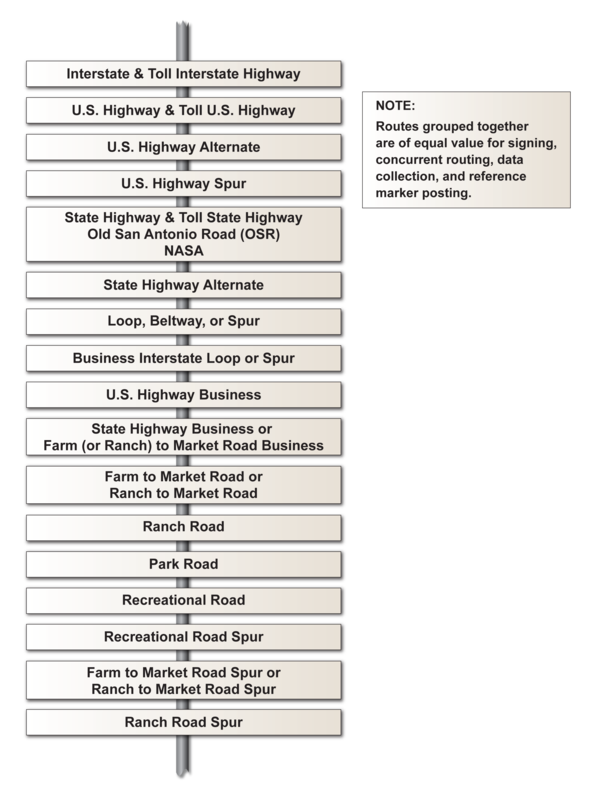 The Texas Reference Marker (TRM) system marks the highway so that all data collected and recorded identifies the correct section of road in the Texas Department of Transportation (TxDOT) database. The Transportation Planning and Programming Division (TPP) has established a highway system hierarchy listing all classes of highways in the database. On roadways having more than one route number assigned to them, it is very important that the route markers (M1 series) be mounted according to the roadway system hierarchy shown in Figure 7-2 to help data collectors record the proper highway number. Markers for higher ranked systems are mounted either above or to the left of lower ranked systems. EXAMPLE: If a US and state highway are concurrent, the US shield is mounted above or to the left of the state highway shield. Markers within a direction or highway class are arranged by number. Lower numbers are mounted either above or to the left of higher numbers. Figure 7-2. Roadway system hierarchy.